Like Ken said, we have back packs for everything for a day hike, camping, traveling and but none of them very light and made for this kind of adventure. At first we both agreed on the OSPRY Exos 38. But, it just didn’t feel like the right fit for me so I did some more researching on the Camino Blogs and read up on this one! 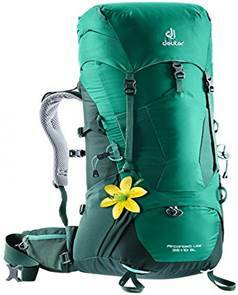 Deuter manufacturer’s back packs that are athletic and adapted specifically for women. They were made by women, for women. They feature a shorter adjustable back length, narrower should harness, and conical shaped hip belt tailored to the female form. It’s light in weight (3 lbs., 8 oz. 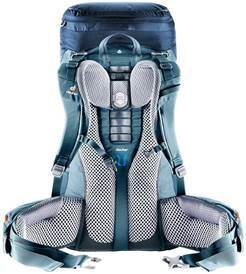 ), ergonomically fit, has a nice modern design and I am anticipating a great backpack for me. This particular back pack is not as light as others we looked at and even than the one that Ken bought ( 1 lb., 6 oz. heavier) but I think it’s going to be better for me purely because of the fit and level of comfortableness I anticipate (fingers crossed). And NO I didn’t pick it because it looks pretty and comes with a flower. I guess this also means that I’m going to have to really watch bringing much of anything and what I do bring better be VERY LIGHT. I’m told by my partner, each man for himself when it comes to carrying. Once I put this on, the most immediate thing I noticed is how comfortable the back supporting system is made. It’s the AIRCONTACT LITE BACK SYSTEM. I am not kidding, women – you will feel it as soon as you put it on. The anatomic profiled x-frame transfers weight on the hips. Now that is one thing I have plenty of (HIPS) so that is going to work very well for me. The crossed aluminum stays create a flexible frame and it’s easy for my body to move. 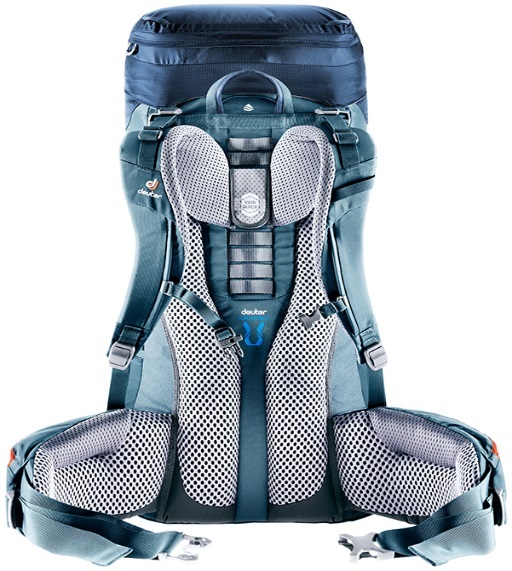 As with most backpacks, there is a VariQuick system that allows an easy, quick adjustment to the individual back length and shoulder straps for extra stability. Take a look at the back of this ladies and gents!!!! Other cool features, a detachable zipped lid compartment with 2 pockets for valuables (that just might be for my snacks) that can be transformed to a day pack. There is an H2O pocket and fixation for the Streamer hydration bladder and an opening for the drink tube (I’ll just use a water bottle). This is kind of unique I think – there is an SOS Label – which gives us tips on what to do in an emergency. I betcha’ though that it doesn’t say what to do if you lost your spouse on the trail!! And guess what there is what they call a Stretch Compartment where you can put all your sweaty clothes!